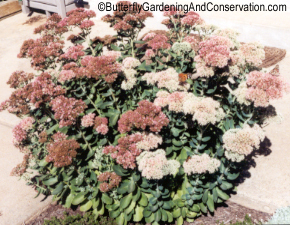 Sedum is a great butterfly attractor. Where I live it blooms late summer/fall when not as many other nectar sources are available. Grows to 18 in. high. Some species are shorter, some grow more like vines. Many nurseries sell it. I recommend Nature Hills Nursery for an online source. Their perennials cost a bit more but are larger, healthier plants with a highly developed root mass! The price is reduced if you buy more plants. Nature Hills also has a plant and seed catalog that they will mail out to you. Members of this family are succulent herbs or shrubs, with 25 genera and 900 species. Jade Trees and Kalanchoe are other members of this species. Many in this family can reproduce by having small parts of the plants fall off and start new plants.